A federal court in Pennsylvania overturned the Revictimization Relief Act, which aimed to ban convicted criminals from speaking publicly. The federal district court on Monday said the statute introduced by lawmakers violated the first amendment rights of one-time death row inmate Mumia Abu-Jamal and other prisoners. The law was introduced in response to Abu-Jamal’s appearance at a Goddard College commencement address in Vermont in October 2014. "The fact that certain plaintiffs have been convicted of infamous or violent crimes is largely irrelevant to our first amendment analysis. A past criminal offense does not extinguish the offender's constitutional right to free expression," Judge Christopher Conner wrote. "The First Amendment does not evanesce at the prison gate." “The point of the law was to look out for victims,” he added. The Revictimization Relief Act, passed by Pennsylvania lawmakers in October 2014, said a victim of a personal injury crime may bring a civil action against an offender to restrict them from conduct that could perpetuate the continuing effect of the crime on the victim, including conduct causing a temporary or permanent state of mental anguish. 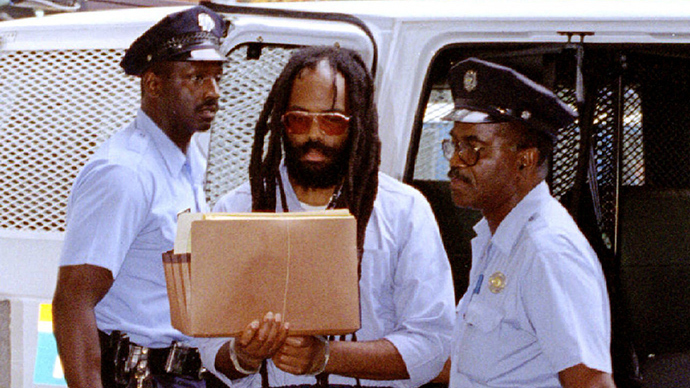 Mumia Abu-Jamal, an American activist and journalist, was convicted in 1982 for the 1981 murder of Pennsylvania Police Officer Daniel Faulkner. He was on death row for 30 years before appeals converted his death penalty to life without parole. Abu-Jamal claims he is a victim of a racist justice system. The Faulkner family, public authorities, police organizations and self-described conservative groups have maintained that Abu-Jamal's trial was fair, his guilt undeniable, and his death sentence appropriate. Wolf said that if the state is going to “take the irrevocable step of executing a human being, its capital sentencing system must be infallible.” He said the system was riddled with flaws and studies had called into question the accuracy and fundamental fairness of Pennsylvania’s capital sentencing system. The studies suggested there were inherent biases indicating that a person is more likely to be charged with a capital offense and sentenced to death row if he is poor or part of a minority racial group; especially so if the victim of the crime was white.